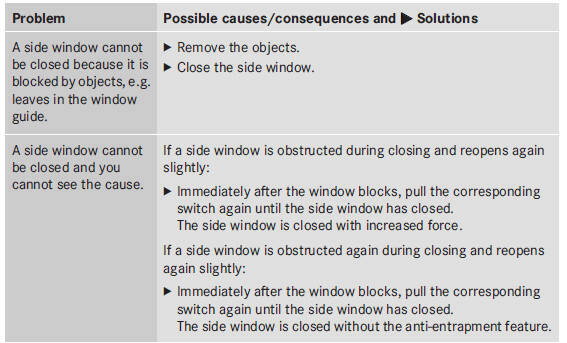 If a side window can no longer be closed fully, you must reset it. ■ Close all the doors. ■ Pull the corresponding switch on the door control panel until the side window is completely closed. ■ Hold the switch for an additional second. If the side window opens again slightly: ■ Immediately pull the corresponding switch on the door control panel until the side window is completely closed . ■ Hold the switch for an additional second. ■ If the corresponding side window remains closed after the button has been released, the side window has been reset correctly. If this is not the case, repeat the steps above again.